Looking for Pallet Racking Solutions in Nottingham? Over the years we have worked with clients on many projects throughout Nottingham and the Midland region. Nottingham was originally known as the city of caves and was famous for the production of Lace, today some of the old buildings can still be seen today. Nottingham has good interconnecting transport links and is becoming an important logistic hub located near the M1. If you are a corporation based in the Nottingham or in the wider East Midlands region and are potentially looking to find a professional supplier of bespoke industrial storage solutions such as pallet racking push back pallet racking, double deep pallet racking, narrow aisle pallet racking, drive in or external pallet racking then we would like to think that you have landed onto the right website. All our services are bespoke in nature, as we understand that every single customer have their own challenges and unique requirements so whatever you need we can usually help. Simply fill out the enquiry form and a member of the team will contact you or better still call a member of the team on 01423 819 057 for an initial chat. 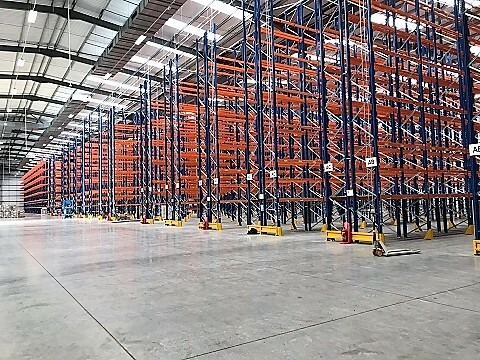 We have been delivering cost effective pallet racking solutions to customers in the Nottingham, East Midlands and wider UK region for over ten years, moreover the team has a couple of hundred years combined experience of the industry. We do not believe there is a one size fits all approach, you will find that all our solutions are bespoke so there is almost no restriction when it comes to finding the perfect solution for you. We believe we can make the best possible use of the workable space that you have, in the vast majority of cases our solutions are small when compared to building extensions or relocation. We have always prided ourselves in offering customers world class customer service with a real attention to detail in everything that we do, our vastly experienced team will ensure that every detail is covered and will manage the entire project on your behalf. It is not just pallet racking we offer We also offer an extensive range of shelving options as well as having the capacity to design and build Mezzanine Floor solutions, so you are based in Nottingham, Leicester, the East Midlands or further afield and need a trusted and professional supplier of pallet racking or storage solutions then call a member of the team today on 01423 819 057.